Dog Training That Works--as Simple as ABC! If you’re a dog owner, you’re already a trainer. From the moment you bring your dog home, you’re teaching him how to behave--and, without realizing it, you could be instilling undesirable behaviors that have to be unlearned. Now, there’s a simple, no-nonsense way to effectively and humanely train your pet--and get the right results. In ABC Practical Guide to Dog Training, Steven Appelbaum, an expert with over 25 years of professional experience training thousands of dogs and hundreds of professional dog trainers, shares his secrets to help you get your dog to behave--giving you tried, true, and tested techniques that work. Complete with an Internet guide to sites on everything from pet supplies and dog parks to boarding kennels and veterinarians, the ABC Practical Guide to Dog Training truly makes training your four-legged friend as simple as ABC! This book teaches owners how to train in a positive manner. The instructions and theories are easy to understand, and most importantly effective. Basic obedience, positive training theory, problem solving (jumping, digging etc. ), off leash obedience and basic obedience are all covered in this book. With in just a few hours of reading this book I was getting my dogs to behave. Steve talkes about a dogs place and how to make that happen. My dogs don't rule the house any more. We do and we have 5 dogs. My dogs don't jump on the furniture or on us anymore. Steve tells how the dogs can have learned behaviors that truely aren't their fault. He will explain how to correct these unwanted behaviors. Don't drop that dog off the human society get this book and work it out with your dog. You will be amazed. Easy reading and it all makes sense. 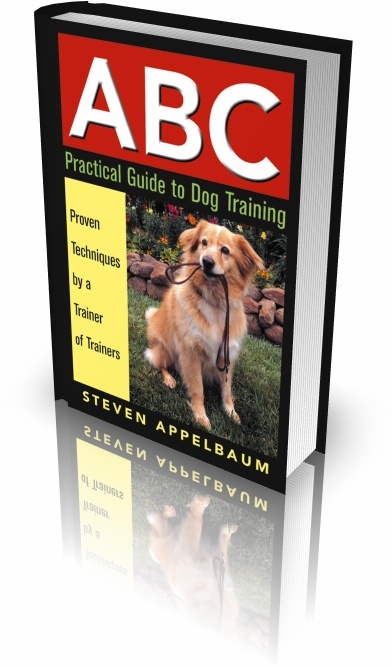 Click the button below to add the ABC Practical Guide to Dog Training to your wish list.